Persistence Market Research (PMR) provides an exclusive analysis of the global technical glass market in its revised report titled “Technical Glass Market: Global Industry Analysis 2013 – 2017 and Forecast 2018 – 2026”. The main aim of this report is to offer exhaustive analysis and insights pertaining to the technical glass market. This report offers a comprehensive analysis of the global technical glass market in terms of market volume (KT) & value (US$ Mn) and year-wise (Y-o-Y) growth in the global technical glass market according to type, end-use and application. The study considers 2017 as the base year with market values estimated for 2018 and forecast developed for the duration 2018 to 2026. The Compound Average Growth Rate (CAGR) is represented from 2018 to 2026. The study covers value chain analysis, market dynamics and industry growth analysis, along with segmental-level projections in a comprehensive manner. As per the industry experts and findings of the report, the global technical glass market is projected to grow at a CAGR of 7.2% between 2018 and 2026, in terms of value. Increasing demand for advance glass is one of the key factors assisting the growth of the technical glass market. The Global Technical Glass market report consists of a detailed overview of the market drivers, trends, value (US$ Mn) and volume (KT) projections, opportunity analysis, parent market overview and recent and ongoing market developments for the study period 2017 to 2026. The global market was pegged at US$ 22.6 Bn in 2017 & is expected to expand at a CAGR of 6.4% during the forecast period. Technological advancements in manufacturing and design techniques used in the glass industry as well as electronic devices and home and commercial appliances are some of the primary factors to create significant opportunities for the manufactures over the projected period. Technical Glass is a ubiquitous material and an umbrella term for a huge variety of glasses with their own distinct chemical and physical properties, such as better chemical resistance, thermal expansion rate, optical transmission and mechanical strength. Technical glasses are used as a raw material in many end-use applications and are constantly evolving. Often technical glasses are used in combination with other high tech materials for high-tech end use. Technical glass, a highly engineered glass, is expected to become a part of everyday life over the forecast period as prominent companies are committing to improving their product offerings through innovative solutions and integrated technologies. In the global market, the soda lime glass segment is estimated to lose share, in terms of value, owing to the fact that its demand is already in the mature phase. That apart, soda lime glass is available in abundance and at a low cost in almost all regions. 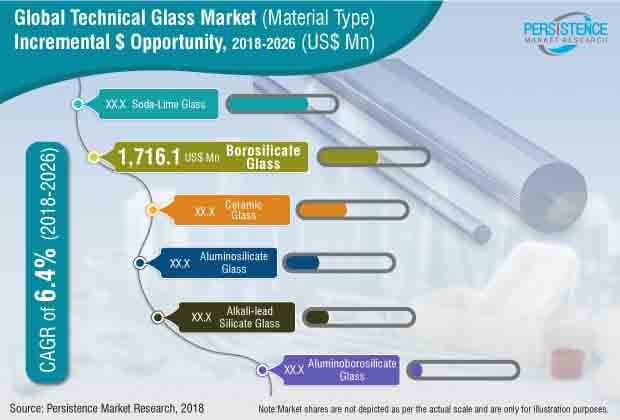 Further, alkali-lead silicate glass is expensive and has better technical properties and thus, is estimated to hold high-value share in the global market. Alkali-lead silicate technical glass has better chemical, corrosive and technical properties. Further, by end use segment, laboratories & pharmaceutical and lighting segments are expected to grow and become 1.4X, in terms of value, during the forecast period. Technical glasses are widely adopted in end-use industries, including laboratories & pharmaceutical, lighting, electronic devices and home & commercial appliances. Glass has played a crucial role since the “electronic revolution” hit the industry. Laboratories & pharmaceutical, lighting, electronic devices and home & commercial appliances are primary end-use sectors, representing over one-fourth of the market. Of this, the electronic devices segment accounts for almost half of the global technical glass market. Further, decline in the prices of glass will also contribute to the growth of the electronic devices segment. The segment is anticipated to grow at 8.8% CAGR, by value, during the forecast period. In addition, these segments are expected to account for about 53.9% share in the total incremental $ opportunity created by the technical glass market. Manufacturing of technical glass is a high energy consuming process and it produces non-biodegradable waste, which has a catastrophic impact on the environment. Thus, recycling and reusing glass is critical. Recycling of technical glass results in efficient production and offers significant environmental benefits. For instance, for every ton of glass material recycled, over a ton of non-renewable or renewable resource is conserved, including raw materials. Further, including recycled glass (cullet) in the furnace makes it less corrosive, thereby prolonging furnace life. Furthermore, recycling of glass is a closed loop process with no by-products. The significance of China in the global market has been growing rapidly after the region opened to public, private and foreign investment. China is the leading manufacturer of technical glass and technical glass products account for almost half of the global technical glass market. Further, the adoption of green energy in the region to slow down the depletion of renewable sources will need new installation of solar energy networks, which in turn, will augment the demand for technical glass market. China is expected to grow and become 1.9X, in terms of value, in the technical glass market. Rest of the regions are expected to exhibit moderate to high growth during the same period. The global Technical Glass market is fairly consolidated, with prominent manufacturers holding substantial market share as of 2017. In the recent past, the market has witnessed compelling advancements from the key players. In 2017, Corning Inc. announced its plan to invest US$ 500 Mn to develop its Valor Technical Glass manufacturing facility in New York, U.S. Some of the prominent players covered in this market study include Schott AG, TAIWAN GLASS IND. CORP., Corning Inc., Heraeus Holding, Asahi Glass Co., Ltd., Nippon Sheet Glass Co., Ltd, Saint-Gobain, Flat Glass Group Co., Ltd., Borosil Glass Works Ltd., Allegion plc, Nippon Electric Glass Co., Ltd, Jhonson Matthey, Guardian Industries, Technical Glass & Aluminium Co. L.L.C, Xinyi Energy Holdings Limited, and Nissink Business Glass B.V.
How has the Technical Glass market evolved in the past four years? What shape is the Technical Glass market expected to take in terms of volume and value during the study period? What are some of the prevailing market dynamics in the Technical Glass market? What are the competition developments and trends in the Technical Glass market? What are some of the underlying macro-economic and industry factors impacting the growth of the Technical Glass market? What are the important key challenges, opportunities and improvement factors for the technical glass market players? What are the important market positioning and key strategies of key manufacturers as per the technical glass market taxonomy? How is the competition structured at present and how has it evolved in the Technical Glass market over the past few years?